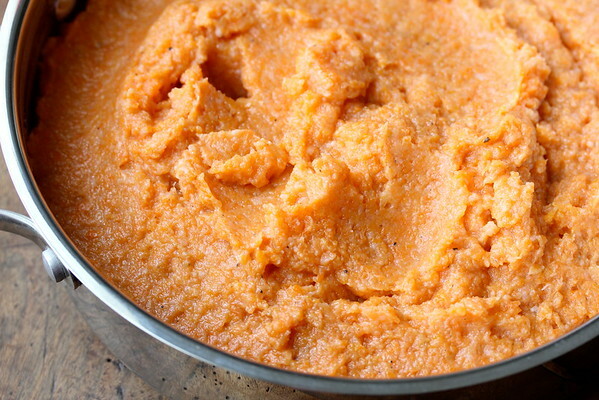 This Carrot and Cauliflower Puree was the perfect side dish for Christmas dinner this year. It was my turn to host the annual family Christmas Eve soiree. On the dinner menu? Ribeye roast beef, red wine dijon cream sauce, spinach gratin, goat cheese mashed potatoes (contributed by my cousin), and this carrot and cauliflower puree. Everyone who came brought appetizers or desserts, so other than making this cranberry crackle tart, I was set. It's so nice when you don't have to do it all. My sister brought a ginger bundt cake, my cousin brought a beautiful vegetable platter, and my nephew made some amazing chocolate crackle cookies that tasted like the most moist brownies ever. Folks also brought dinner rolls, crab canapés, and lots of cheese and crackers. Dinner for 23? Piece of cake. Especially when you have lots of help. This vegetable is perfect for making a day in advance and reheating on the stove top when you are ready to serve dinner, freeing your oven for other dishes. The secret to the deliciousness of this dish is browned butter, or beurre noisette. It adds a richness to the usually bland vegetables. This is an amazingly simple side dish that is also elegant and tasty. This recipe can easily be doubled or halved. To puree the carrots and cauliflower, I used the medium grind disk from this food mill. It was super easy to use and even easier to clean. This recipe served 22 when accompanied by two other sides. Fill a 4 quart saucepan of water to a boil. Add 2 tablespoons of salt. Add the cauliflower and boil for 20 minutes, until tender. With a slotted spoon or spider strainer, remove the cauliflower to colander. Add the carrots, and boil for 20 more minutes until tender. With a slotted spoon or spider strainer, remove the carrots to the colander. Puree the vegetables with a food mill into a stove top safe serving dish (if you don't have one, puree the vegetables into a saucepan and move them into a serving dish when ready to serve). In a 10 inch saute pan, heat the butter over medium low heat. The butter will begin to "boil." When the butter just begins to turn brown (be careful not to over brown the butter), remove it from the heat, and pour it into the vegetable puree. Stir, add the salt and pepper, and stir again. When ready to serve, reheat on the stove top. Adapted from Make It Ahead: A Barefoot Contessa Cookbook, by Ina Garten. Great recipe, Karen! And what a coincidence, we had a ribeye steak roast for our Christmas dinner, that turned out delicious with a broccoli soufflee type side dish. 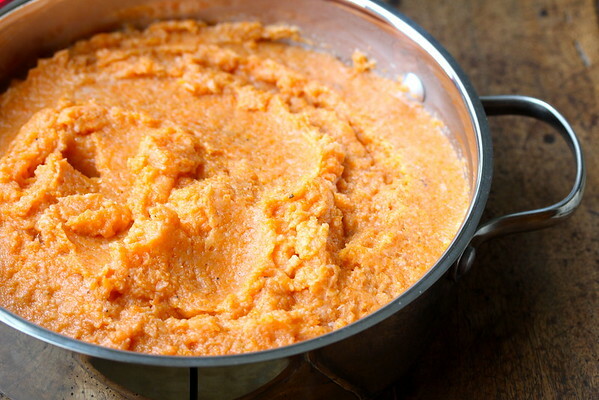 I love this cauli-carrot puree, the use of browned butter is perfect, I should do that next time - I sometiems mix and match root veggies for a puree, often using cauliflower, but the butter would make any combination shine! I tried this today & all I tasted was butter. Very bland. What did I do wrong? Did you use enough salt and pepper? Did you brown the butter? Sometimes carrots can be bland too.